CNG: Printed Auction CNG 75. BOEOTIA, Thebes. Circa 425-375 BC. Lot of AR Hemidrachms. Sale: CNG 75, Lot: 231. Estimate $500. BOEOTIA, Thebes. Circa 425-375 BC. 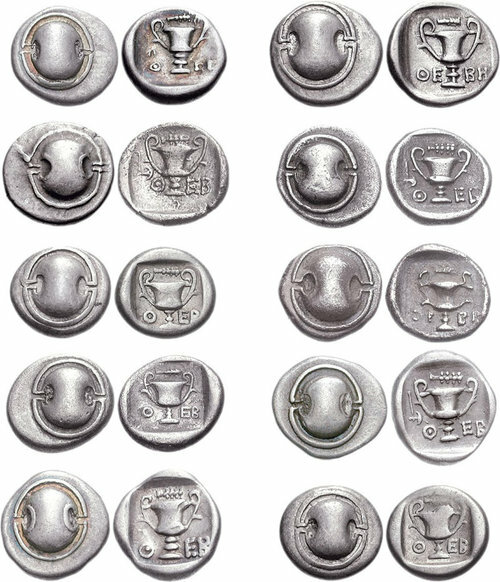 Lot of AR Hemidrachms. All coins: Boeotian shield / Amphora with various legend varieties and symbols. Includes the following: BCD Boiotia 408 (4) // 410 // 411 (3) // 412 (2). VF or better condition. COINS SOLD AS IS, NO RETURNS. Ten (10) coins in lot.